George Lepp is serious about capturing bald eagles, photographically speaking. 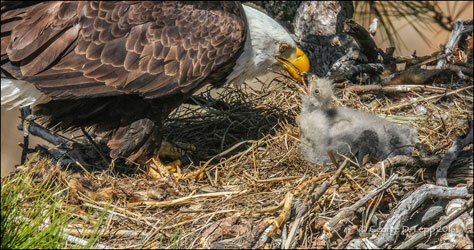 Two years ago he spent 12 weeks and over 80 hours documenting a pair of bald eagles from hatching to fledging. After watching the 10-minute movie in the Welcome Center he made of the process, we wanted to learn more about George. Some of his credits include Field Editor for Outdoor Photographer Magazine and a Canon "Explorer of Light," which features the industry's most influential photographers. His images have appeared in some of the world's most widely viewed venues and on the covers of many books and magazines too numerous to list here. We met up with him early one morning along the rim of the Bivy campground, where posted signs indicate not to camp. The bald eagles nest in a tall ponderosa just across the rim. While you can't camp there, George is quick to point out that the eagles really don't mind you hanging out with your binoculars. In this 3.5 minute video, he describes the unique position of the Smith Rock nest, shows us how he is able to capture his spectacular images, and shares details about his feathered friends. All this plus images and video he shot that day. Want more? Spend 10 minutes to see the transformation from egg to soaring eagle in George's amazing piece from 2 years ago on the bald eagles of Smith Rock.